The Thalassa Museum is directed by the Pierides Foundation, and opened to the public in August of 2005. It operates in association with the Tornaritis-Pierides Marine Life Foundation and the Hellenic Institute for the Preservation of Nautical Tradition. Situated at the heart of Agia Napa on Cyprus, the sea is the museum’s main subject in its exhibits. The Thalassa Museum is the first of its kind throughout the entire Mediterranean region. The purpose of the museum is presentation to the public audience, both foreign visitors and locals, of the significance and impact of the sea on the island of Cyprus’ history. The various exhibits seen throughout the museum cover the chronological timeline of the island, from paleontological times to historical periods to modern day. Housed within a three-story building that is made up of metal, wood, onyx, and marble, the museum provides unique experiences that appeal to all of the senses of visitors with the “bird’s eye view.” The Thalassa Museum incorporates exhibits on the subjects of marine life, archaeology, geology, and paleontology across its sevel levels. These exhibits are displayed within underground showcases, allowing guests to be able to walk above the exhibits and view the items in the modern showcases from the top. The exhibits are freely placed throughout the museum, while others hang from the roof. 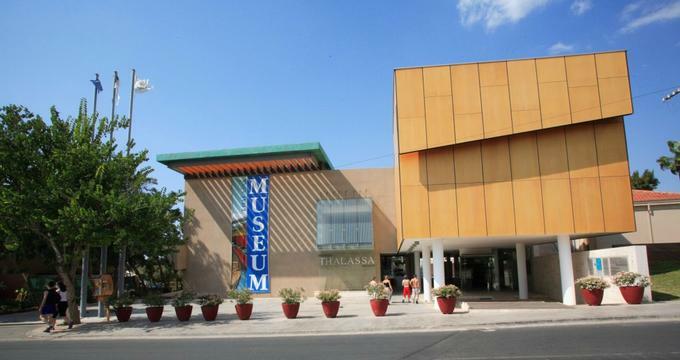 The Thalassa Museum also includes a gift shop, a cafe, an open amphitheatre, and a hall that can be used for shows, workshops, seminars, and lectures that complement the contemporary museum complex. The collections at the Thalassa Museum consists of objects from the Hellenic Institute for the Preservation of Nautical Tradition, the Museum Pierides-Laiki Group Cultural Centre, the Pierides-Tornaritis Marine Life Foundation and the Cyprus Department of Antiquities. There are also items from the personal collection of Demetrios Z. Pierides. The main exhibit at the museum is the ‘Kyrenia II’ vessel. The ‘Kyrenia II’ vessel is an exact, life-size reproductions of the ancient vessel of Kyrenia from the Classical period, which was around 400 B.C. The replica was constructed in 1985 by the Hellenic Institute for the Preservation of Nautical Tradition for experimental scientific purposes under the direction of Harry Tzalas. The ship was also built with the support Susan Katzev, Richard Steffy, and Michael Katzev, who were the leaders of the underwater excavation and preservation of the Kyrenia old shipwreck. The ‘Kyrenia II’ was displayed in many cities throughout the country of Greece, as well as exhibited in cities across the world, such as Nara in Japan, Hamburg in Germany, Sevilla in Spain, and New York City. Also on display at the Thalassa Museum is the PAPYRELLA, which is a replica of a papyrus ship from the Mesolithic period, around 9200 B.C. that was used to transport obsidian throughout the Aegean Sea. The displays of objects from the Tornaritis-Pierides Marine Life Foundation include fossilised shells, fishes, corals, and ammonites from the late Cretaceous period. Some of the most important items of the Cypriot antiquities at the museum are a vase from the Early Bronze Age III and a clay model of a vessel from the Cypro-Archaic II period.